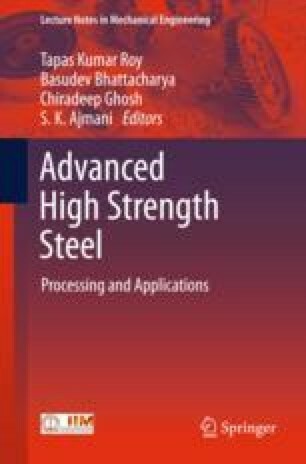 Low-carbon steel (LCS) work pieces are deformed through equal-channel angular pressing (ECAP) up to an equivalent strain of 16.8 (28 passes) at room temperature. Microstructures are characterized by optical microscopy and transmission electron microscopy. Mechanical properties are evaluated by tensile testing and hardness measurements. The material gets refined to ultra-fine level of average grain size of 0.2 μm and the ultimate tensile strength improves from 368 MPa to ultra-high strength of 1008 MPa. ECAP followed by cryorolling of low-carbon steel at −50 °C for 75% of reduction in the area produces bulk nanostructured grains of size 87 nm. The strength of the material further enhanced to 1238 MPa. The strengthening is due to reduction in grain size and high defect density. But the material loses its ductility due to high defect density and nonequilibrium nature of grain boundaries. Flash annealing at 600 °C of bulk nanostructured low-carbon steel produces the bimodal grain size distribution of UFG and micron-sized grains in the microstructure which partially recovers uniform elongation of 20% with improved strength. The material still maintains hardness which is twice as that of as-received material but it decreases with increase in flash annealing temperature. D. Verma, N.K. Mukhopadhyay, G.V.S. Sastry and R. Manna, Transactions of the Indian Institute of Metals, (2016) https://doi.org/10.1007/s12666-016-0881-0. D. Verma, S. Pandey, A. Bansal, S. Upadhyay, N.K. Mukhopadhyay, G.V.S. Sastry and R. Manna, Journal of Materials Engineering and Performance, (2016), 1–10. https://doi.org/10.1007/s11665-016-2392-x.